The downfall is the fridge as all they have done is empty the mini-bar fridge for your use - not big enough for a pint of milk or bottle of water far less a 4 pack far or any of the the usual self catering groceries!! After a day of getting nowhere went next door to Seaview Country and complained to Airtours Rep (no rep at Aura) and to be fair within the day we had a larger fridge that although still small we could survive with. Last minute holiday,found it to be a very good deal. It was the first time I took my little one away abroad, we all loved it. 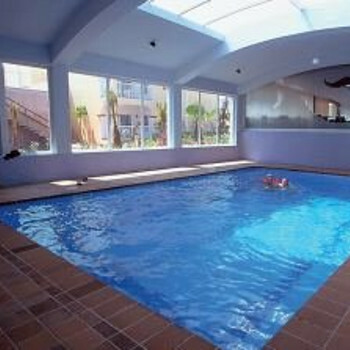 Staff friendly, a very family friendly holiday with lots of noise from the children. We had good weather for this time of year. Food in the restaurant and snack bar was not very good. The snack bar outside the hotel did lovely take away pizzas. Beach is near by and a nice place to go, although avoid going on the weekend as the Spanish can be a little rude.